These pages show an Edwardian house losing its coating. 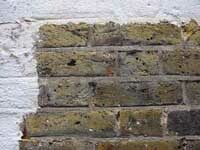 There will be a further stage for repointing and replacing damaged bricks. The pictures below show the progress of the project. 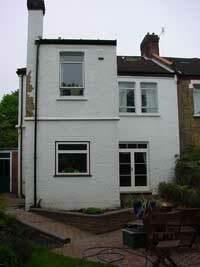 The house, after the removal of plants and before the work commences; note partial removal of loose paint from pebbledash render. The test patch to determine which chemical stripper would work and to give a fixed price contract. Note that this stripper has preserved the patina of over 90 years of London grime. The topsoil and all the plants need to be removed; there will be considerable paint waste, and lots of water from the rinsing stage. The scaffolding is in place. This took three men six hours to erect and will remain in place for at least two weeks. Day 1: Paintwork to be protected has to be masked. After a frustrating day, some progress has been made. For this paint, two chemicals are needed; the second will be applied later. Day 2: The doorway to the outside toilet, now part of the kitchen, has been filled with two different types of brick, and not cut into the original. Otherwise, progress was good. The pointing and brick surfaces are resisting the hot, high pressure water well. 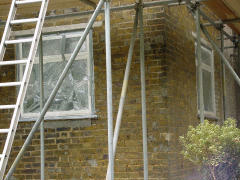 The remaining windows have been masked off. Day 3: The second chemical was applied to the flank wall, and the first to the rear. The estimate for the project will now be six days! 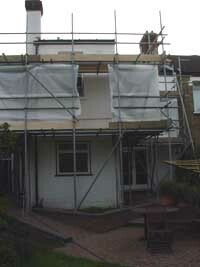 And then the removal of the render will start. Day 5: After days 4 and 5, the end of the chemical stripping is in sight. 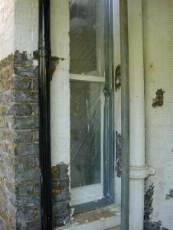 Below and above this window are cosmetic problems which will need attention - the modern window has a crude concrete lintel and the opening of the replaced window filled at the bottom with cement or something else. 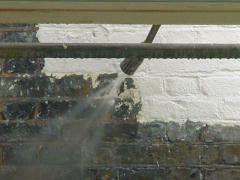 Action shot showing the high pressure jet blasting the softened paint. Day 6 and the chemical stripping is complete. 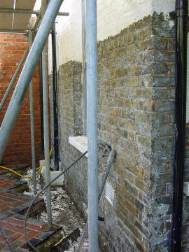 This project presents a typical conundrum; the original problem was serious but localised damp, and an inappropriate 'look' to the house. Without the damp, the best approach would have been to allow the paint to erode over time, protecting any exposed wall with a lime-based paint. With the damp problem, the balance of the debate shifts. If the pebble-dash render had been unpainted, it would have been best to open up cracks and fill them with a lime mortar. The paint tipped the argument in favour of the more invasive and destructive approach adopted; full-scale removal and re-rendering. In the case of an architecturally unique building, a more cautious approach would still be favoured. Insist on a test patch; this will cost money but ensures that the chemicals will work and that brickwork should not be damaged. If you accept the quotation, the cost is typically refunded. 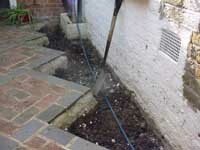 Remove all plants and topsoil upto two metres from the walls - or one metre if you can accept some damage and paint residue. Move any valuable curtains, carpets and other items from close to the windows; the washing water often leaks into the building. 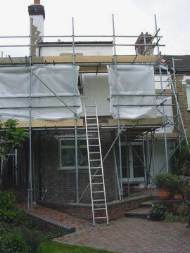 Take advantage of the scaffolding to redecorate, renew guttering etc. 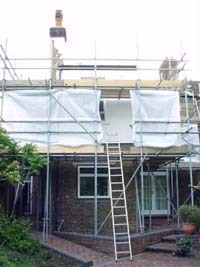 This is not a cheap process; expect to pay £500-£1000 for the scaffolding and £2000-£5000 for the stripping, depending on the chemicals needed and the wall area. Expect the worst; paint is usually applied to conceal problems. You will have to repoint at least some of the wall, remove cement-filled holes, and reseal gaps such as those between window frames and brickwork. Make sure you use lime-based products for these tasks - not silicone fillers, cement etc.